The Westin Palace, Madrid – our hotel for two nights. Leaving: around 9:30am – this ticket is already booked! Check out Ryan’s post here on direct online booking to potentially save a lot of money on train tickets. What to Do: Alcazar, Flamenco, food! Leaving: We aren’t sure yet. There are a few train options we’re looking at – one leaving around 7am, one that would leave around 9:30am and one that would leave around 12pm. Arriving: Depends on the train we decide to take from Sevilla, but we would get in around 10:30am, 1:30pm, or 3pm at the Granada train station. Leaving: around 9:00am from the Granada train station. This ticket has also already been booked. 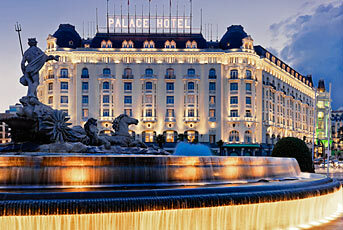 Staying: At The Westin Palace, Madrid. This is the only hotel we haven’t written a post on, so I wanted to share the information now. Long story short: Starwood had a “points and cash” option for the nights we will be staying (pay partially with starpoints, partially with “cash” in USD – this is usually an awesome deal) and we couldn’t pass it up. The location is great, so honestly, we didn’t even look at other options. Leaving: around 11:30am from the Madrid airport. We’ll continue to do research on activities, places to eat, and things to see, but we look forward to changing our plans according to what we want to do while we’re there! This entry was posted in Itinerary, Travel, Travel Planning and tagged Barcelona, Europe, Granada, Lisbon, Madrid, Portugal, Portugal/Spain 2012 Trip, Sevilla, Spain, travel planning by Kristin. Bookmark the permalink.